The Ukrainian authorities which can prosecute business crimes are: the general prosecutor’s office; and departments of the prosecutor’s office in different regions. However, only the prosecutor’s office has the authority to charge an individual or entity with a crime. For investigation purposes, all information and investigations provided by different law enforcement authorities such as police, tax police, the Security Service, and the National Anti-Corruption Bureau can be used. Currently, our law enforcement office is under reform, and this, in fact, creates problems such as the lack of power to investigate different kinds of crime or difficulties due to different authorities having the same power to investigate the same criminal activity. 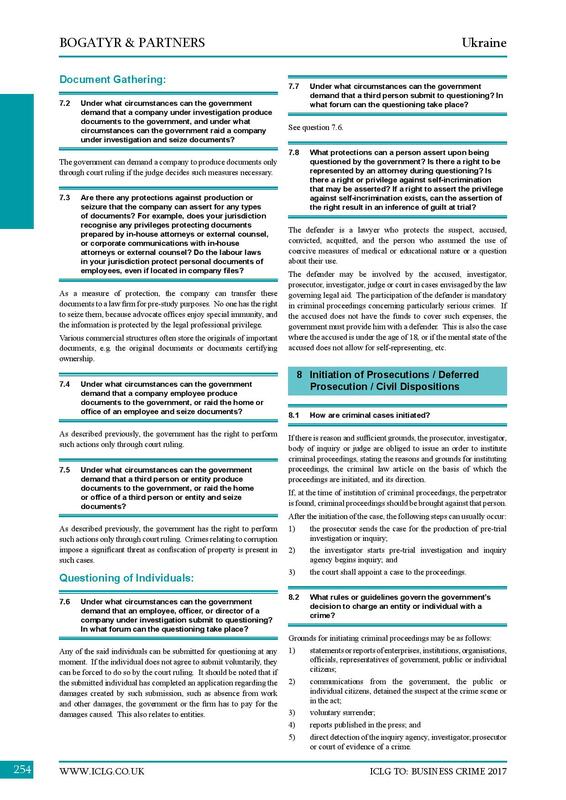 General principles are explained in the Criminal Procedural Code of Ukraine; the prosecutor’s office defines the jurisdiction through a special procedural heading. In cases of disagreement, the defendant can challenge the jurisdiction through a special investigating judge. 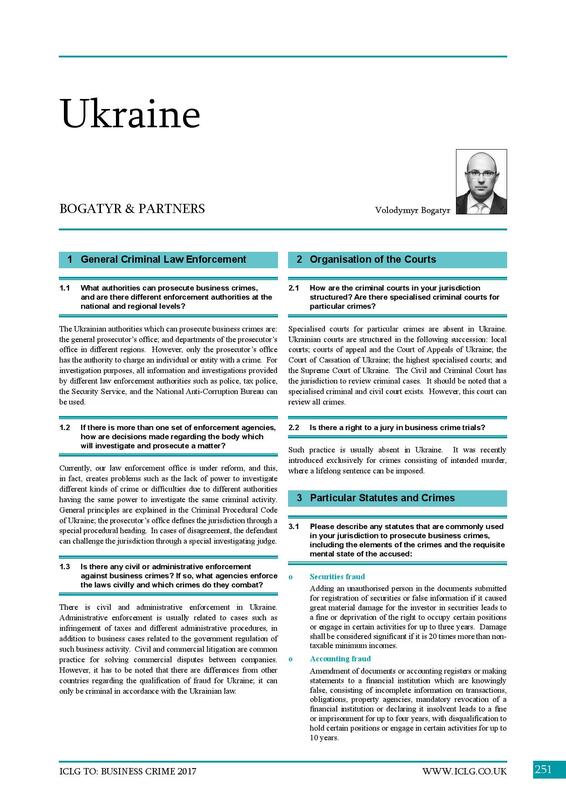 There is civil and administrative enforcement in Ukraine. Administrative enforcement is usually related to cases such as infringement of taxes and different administrative procedures, in addition to business cases related to the government regulation of such business activity. Civil and commercial litigation are common practices for solving commercial disputes between companies. However, it has to be noted that there are differences from other countries regarding the qualification of fraud for Ukraine; it can only be criminal in accordance with the Ukrainian law. Specialised courts for particular crimes are absent in Ukraine. Ukrainian courts are structured in the following succession: local courts; courts of appeal and the Court of Appeals of Ukraine; the Court of Cassation of Ukraine; the highest specialised courts; and the Supreme Court of Ukraine. The Сivil and Criminal Court has the jurisdiction to review criminal cases. It should be noted that a specialised criminal and civil court exists. However, this court can review all crimes. Such practice is usually absent in Ukraine. It was recently introduced exclusively for crimes consisting of intended murder, where a lifelong sentence can be imposed. 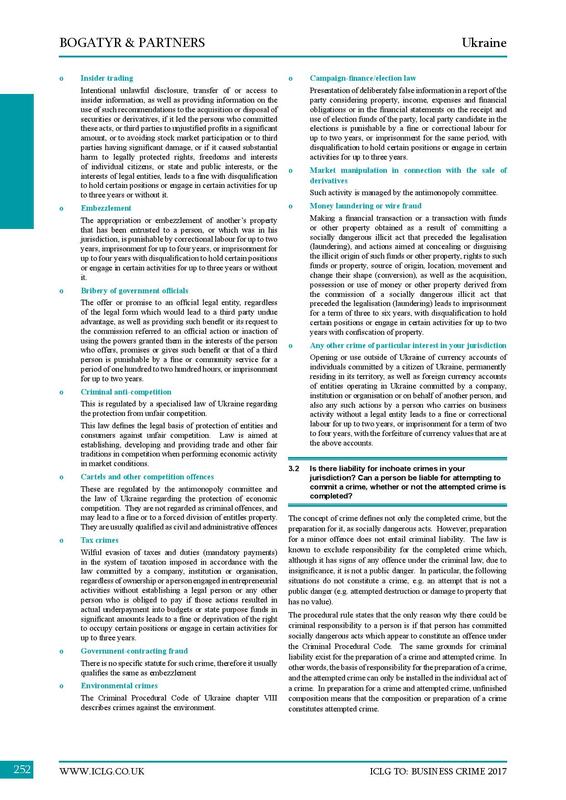 Adding an unauthorised person in the documents submitted for registration of securities or false information if it caused great material damage for the investor in securities leads to a fine or deprivation of the right to occupy certain positions or engage in certain activities for up to three years. Damage shall be considered significant if it is 20 times more than non-taxable minimum incomes. Amendment of documents or accounting registers or making statements to a financial institution which are knowingly false, consisting of incomplete information on transactions, obligations, property agencies, mandatory revocation of a financial institution or declaring it insolvent leads to a fine or imprisonment for up to four years, with disqualification to hold certain positions or engage in certain activities for up to 10 years. Intentional unlawful disclosure, transfer of or access to insider information, as well as providing information on the use of such recommendations to the acquisition or disposal of securities or derivatives, if it led the persons who committed these acts, or third parties to unjustified profits in a significant amount, or to avoiding stock market participation or to third parties having significant damage, or if it caused substantial harm to legally protected rights, freedoms and interests of individual citizens, or state and public interests, or the interests of legal entities, leads to a fine with disqualification to hold certain positions or engage in certain activities for up to three years or without it. The appropriation or embezzlement of another’s property that has been entrusted to a person, or which was in his jurisdiction, is punishable by correctional labour for up to two years, imprisonment for up to four years, or imprisonment for up to four years with disqualification to hold certain positions or engage in certain activities for up to three years or without it. The offer or promise to an official legal entity, regardless of the legal form which would lead to a third party undue advantage, as well as providing such benefit or its request to the commission referred to an official action or inaction of using the powers granted them in the interests of the person who offers, promises or gives such benefit or that of a third person, is punishable by a fine or community service for a period of 100 to 200 hours, or imprisonment for up to two years. This is regulated by a specialised law of Ukraine regarding the protection from unfair competition. This law defines the legal basis of protection of entities and consumers against unfair competition. This law is aimed at establishing, developing and providing trade and other fair traditions in competition when performing economic activity in market conditions. These are regulated by the antimonopoly committee and the law of Ukraine regarding the protection of economic competition. They are not regarded as criminal offences, and may lead to a fine or to a forced division of entitled property. They are usually qualified as civil and administrative offences. Wilful evasion of taxes and duties (mandatory payments) in the system of taxation imposed in accordance with the law committed by a company, institution or organisation, regardless of ownership or a person engaged in entrepreneurial activities without establishing a legal person or any other person who is obliged to pay if those actions resulted in actual underpayment into budgets or state purpose funds in significant amounts, leads to a fine or deprivation of the right to occupy certain positions or engage in certain activities for up to three years. There is no specific statute for such crime; therefore, it usually constitutes the same as embezzlement. The Criminal Procedural Code of Ukraine chapter VIII describes crimes against the environment. Presentation of deliberately false information in a report of the party considering property, income, expenses and financial obligations or in the financial statements on the receipt and use of election funds of the party, local party candidate in the elections is punishable by a fine or correctional labour for up to two years, or imprisonment for the same period, with disqualification to hold certain positions or engage in certain activities for up to three years. Making a financial transaction or a transaction with funds or other property obtained as a result of committing a socially dangerous illicit act that preceded the legalisation (laundering), and actions aimed at concealing or disguising the illicit origin of such funds or other property, rights to such funds or property, source of origin, location, movement and change their shape (conversion), as well as the acquisition, possession or use of money or other property derived from the commission of a socially dangerous illicit act that preceded the legalisation (laundering) leads to imprisonment for a term of three to six years, with disqualification to hold certain positions or engage in certain activities for up to two years with confiscation of property. Opening or use outside of Ukraine of currency accounts of individuals committed by a citizen of Ukraine, permanently residing in its territory, as well as foreign currency accounts of entities operating in Ukraine committed by a company, institution or organisation or on behalf of another person, and also any such actions by a person who carries on business activity without a legal entity leads to a fine or correctional labour for up to two years, or imprisonment for a term of two to four years, with the forfeiture of currency values that are at the above accounts. The concept of crime defines not only the completed crime, but the preparation for it, as socially dangerous acts. However, preparation for a minor offence does not entail criminal liability. The law is known to exclude responsibility for the completed crime which, although it has signs of any offence under the criminal law, due to insignificance, it is not a public danger. In particular, the following situations do not constitute a crime, e.g. an attempt that is not a public danger (e.g. attempted destruction or damage to property that has no value). The procedural rule states that the only reason why there could be criminal responsibility to a person is if that person has committed socially dangerous acts which appear to constitute an offence under the Criminal Procedural Code. The same grounds for criminal liability exist for the preparation of a crime and attempted crime. In other words, the basis of responsibility for the preparation of a crime and the attempted crime can only be installed in the individual act of a crime. In preparation for a crime and attempted crime, unfinished composition means that the composition or preparation of a crime constitutes attempted crime. An entity can be liable for criminal offences regarding its economic activity, such as the list of offences provided above. The conduct of the employee is taken into account in most cases, as in where the actions of the employee have led to violation of the law by the entity. However, in most cases, the employee is not liable for the crime, while the entity is. It is only the entity which is liable for crimes committed by the employed officials. There are institutes of legal liability; however, in practice, they are rarely used. This is reviewed individually for every case. See question 4.2. The limitations period depends on the severity of the crime. It begins running from the moment of committing the crime or from the moment of detecting the crime, if the first is unknown. Yes, in cases where the crime was detected after the limitations period has already passed. However, this does not apply to cases where the crime was committed against peace and humanity. The investigator and the prosecutor must (but no later than 24 hours after application, notification of committing a criminal offence or after self-identifying it from any sources of circumstances that may indicate criminal offence) submit relevant information to the Unified Register of pre-trial investigation immediately. The investigator, who will carry out pre-trial investigation, should be determined by the head of the pre-trial investigation. Pre-trial investigation begins after entering data in the Unified Register of pre-trial investigations. Regulations of the Unified Register of pre-trial investigations and the procedure of forming and maintaining is approved by Prosecutor General of Ukraine in coordination with the Ministry of Internal Affairs of Ukraine, Security Service of Ukraine, and the National Anti-Corruption Bureau of Ukraine, as well as the body that monitors the compliance of tax laws. 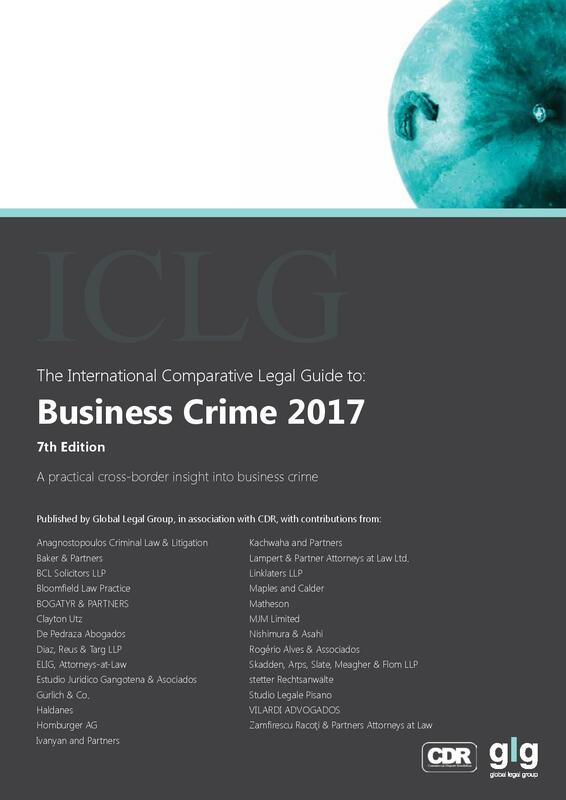 International cooperation in criminal proceedings lies in taking the necessary measures to provide international legal assistance through the exchange of documents, execution of certain proceedings, extradition of persons who have committed criminal offences, temporary transfer of persons taking over the criminal prosecution, transfer of sentenced persons and execution of judgments. International treaties of Ukraine may provide different measures than those described in the Criminal Procedural Code, i.e. forms of cooperation in the criminal proceedings. The practice of cooperating with foreign authorities is rather undeveloped at present, since Ukrainian authorities, in practice, are reluctant to do so and have inadequate training to do so. The government acts through covert investigative actions and has the power to collect information from personal computers, data storage devices, telephones and other devices through the ruling of the court. The government can demand a company to produce documents only through court ruling if the judge decides such measures necessary. 7.3 Are there any protections against production or seizure that the company can assert for any types of documents? For example, does your jurisdiction recognise any privileges protecting documents prepared by in-house attorneys or external counsel, or corporate communications with in-house attorneys or external counsel? Do the labour laws in your jurisdiction protect personal documents of employees, even if located in company files? As a measure of protection, the company can transfer these documents to a law firm for pre-study purposes. No one has the right to seize them, because advocate offices enjoy special immunity, and the information is protected by the legal professional privilege. Various commercial structures often store the originals of important documents, e.g. the original documents or documents certifying ownership. 7.4 Under what circumstances can the government demand that a company employee produce documents to the government, or raid the home or office of an employee and seize documents? As described previously, the government has the right to perform such actions only through court ruling. 7.5 Under what circumstances can the government demand that a third person or entity produce documents to the government, or raid the home or office of a third person or entity and seize documents? As described previously, the government has the right to perform such actions only through court ruling. Crimes relating to corruption impose a significant threat as confiscation of property is present in such cases. 7.6 Under what circumstances can the government demand that an employee, officer, or director of a company under investigation submit to questioning? In what forum can the questioning take place? Any of the said individuals can be submitted for questioning at any moment. If the individual does not agree to submit voluntarily, they can be forced to do so by the court ruling. It should be noted that if the submitted individual has completed an application regarding the damages created by such submission, such as absence from work and other damages, the government or the firm has to pay for the damages caused. This also relates to entities. 7.7 Under what circumstances can the government demand that a third person submit to questioning? In what forum can the questioning take place? 7.8 What protections can a person assert upon being questioned by the government? Is there a right to be represented by an attorney during questioning? Is there a right or privilege against self-incrimination that may be asserted? If a right to assert the privilege against self-incrimination exists, can the assertion of the right result in an inference of guilt at trial? The defender is a lawyer who protects the suspect, accused, convicted, acquitted, and the person who assumed the use of coercive measures of medical or educational nature or a question about their use. The defender may be involved by the accused, investigator, prosecutor, investigator, judge or court in cases envisaged by the law governing legal aid. The participation of the defender is mandatory in criminal proceedings concerning particularly serious crimes. If the accused does not have the funds to cover such expenses, the government must provide him with a defender. This is also the case where the accused is under the age of 18, or if the mental state of the accused does not allow for self-representing, etc. 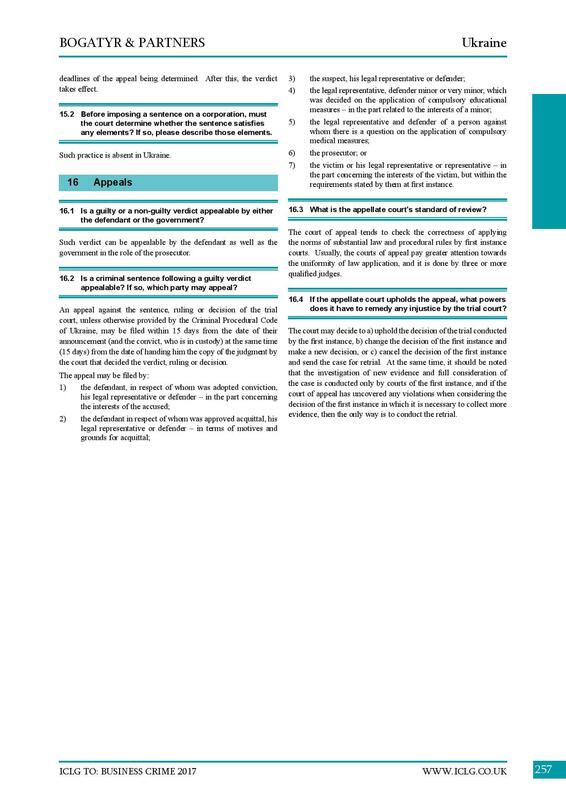 If there is reason and sufficient grounds, the prosecutor, investigator, body of inquiry or judge are obliged to issue an order to institute criminal proceedings, stating the reasons and grounds for instituting proceedings, the criminal law article on the basis of which the proceedings are initiated, and its direction. If, at the time of institution of criminal proceedings, the perpetrator is found, criminal proceedings should be brought against that person. 3) the court shall appoint a case to the proceedings. 5) direct detection of the inquiry agency, investigator, prosecutor or court of evidence of a crime. Such agreements are not provided in the Ukrainian law system. However, there are agreements of delaying execution and agreement of reconciliation, as well as the agreement of sincere repentance. Agreement of reconciliation between the victim and the suspect or the accused may be concluded in the proceedings concerning criminal offences or crimes of small and medium severity in criminal proceedings in the form of private prosecution. 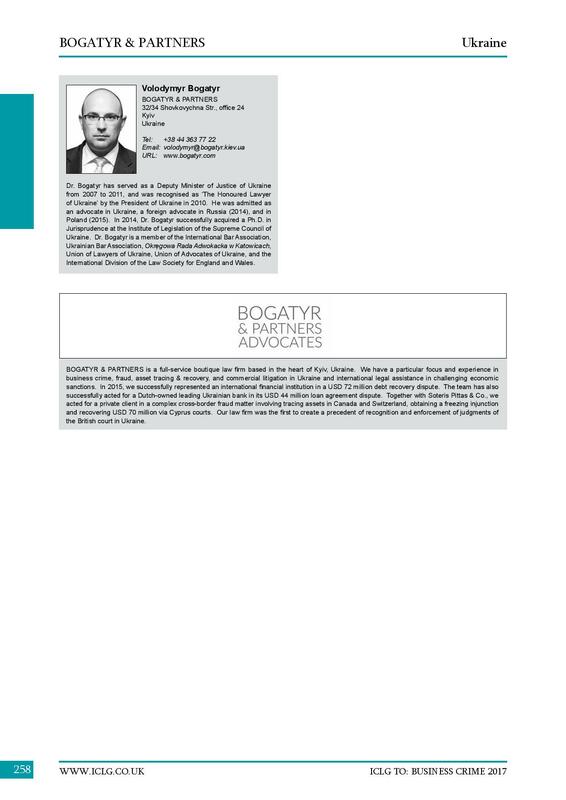 The conclusion of the settlement in criminal proceedings against the authorised person of the legal person who committed a criminal offence, in respect of which that person carried out proceedings against a legal entity, is not allowed. 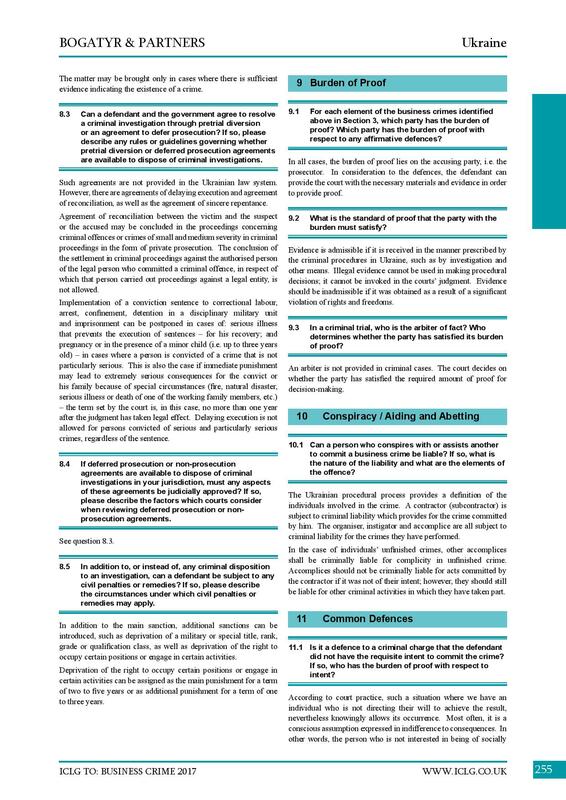 Implementation of a conviction sentence to correctional labour, arrest, confinement, detention in a disciplinary military unit and imprisonment can be postponed in cases of: serious illness that prevents the execution of sentences – for his recovery; and pregnancy or in the presence of a minor child (i.e. up to three years old) – in cases where a person is convicted of a crime that is not particularly serious. This is also the case if immediate punishment may lead to extremely serious consequences for the convict or his family because of special circumstances (fire, natural disaster, serious illness or death of one of the working family members, etc.) – the term set by the court is, in this case, no more than one year after the judgment has taken legal effect. Delaying execution is not allowed for persons convicted of serious and particularly serious crimes, regardless of the sentence. In addition to the main sanction, additional sanctions can be introduced, such as deprivation of a military or special title, rank, grade or qualification class, as well as deprivation of the right to occupy certain positions or engage in certain activities. Deprivation of the right to occupy certain positions or engage in certain activities can be assigned as the main punishment for a term of two to five years or as additional punishment for a term of one to three years. In all cases, the burden of proof lies on the accusing party, i.e. the prosecutor. In consideration to the defences, the defendant can provide the court with the necessary materials and evidence in order to provide proof. Evidence is admissible if it is received in the manner prescribed by the criminal procedures in Ukraine, such as by investigation and other means. Illegal evidence cannot be used in making procedural decisions; it cannot be invoked in the courts’ judgment. Evidence should be inadmissible if it was obtained as a result of a significant violation of rights and freedoms. An arbiter is not provided in criminal cases. The court decides on whether the party has satisfied the required amount of proof for decision-making. The Ukrainian procedural process provides a definition of the individuals involved in the crime. A contractor (subcontractor) is subject to criminal liability which provides for the crime committed by him. The organiser, instigator and accomplice are all subject to criminal liability for the crimes they have performed. In the case of individuals’ unfinished crimes, other accomplices shall be criminally liable for complicity in unfinished crime. Accomplices should not be criminally liable for acts committed by the contractor if it was not of their intent; however, they should still be liable for other criminal activities in which they have taken part. According to court practice, such a situation where we have an individual who is not directing their will to achieve the result, nevertheless knowingly allows its occurrence. Most often, it is a conscious assumption expressed in indifference to consequences. In other words, the person who is not interested in being of socially dangerous consequences of his act still allows for the possibility of the outcome; therefore, he should still be liable on account of his indifference. In Ukrainian law, ignorance of the law does not free the individual from the consequences. In such cases, the burden of proof lies on the defendant and his representatives. However, in general practice, it is viewed in the same way as ignorance of the law; therefore, it does not free the individual from the consequences. 12.1 If a person or entity becomes aware that a crime has been committed, must the person or entity report the crime to the government? Can the person or entity be liable for failing to report the crime to the government? Failing to report a crime which is of great severity may lead to an imprisonment for up to three months or imprisonment for up to three years, depending on the level of seriousness. Family members or close relatives of the person who committed the crime should not be liable for failing to report. 13.1 If a person voluntarily discloses criminal conduct to the government or cooperates in a government criminal investigation of the person, can the person request leniency from the government? If so, what rules or guidelines govern the government’s ability to offer leniency in exchange for voluntary disclosures or cooperation? The person who first committed a minor offence or a crime of medium severity due to carelessness, except for corruption offences, can exempted from criminal liability if they sincerely repent after having committed the crime, actively contribute to the detection of crime and fully reimburse the damages caused by it. The agreement of sincere repentance puts obligations on the suspect or accused to cooperate in exposing the criminal offence committed by himself or another person. See question 14.1. It is possible in the case of sincere repentance by the defendant of the offence as fact. The defendant can negotiate the charge with the prosecutor in this case. It is possible to sign a delayed prosecution agreement between the defendant and the prosecutor or the victim. The court has the power to allow such agreements or decline them if the content does not meet the requirements. If the agreements are reached during the proceedings, the court shall immediately stop to conduct the proceedings and proceed to examine the agreement. Before making a decision on approval of the agreement on the recognition of guilt, the court must ensure that the agreement is voluntary. The court examines the agreement to meet the requirements of the Criminal Procedural Code and/or the law. 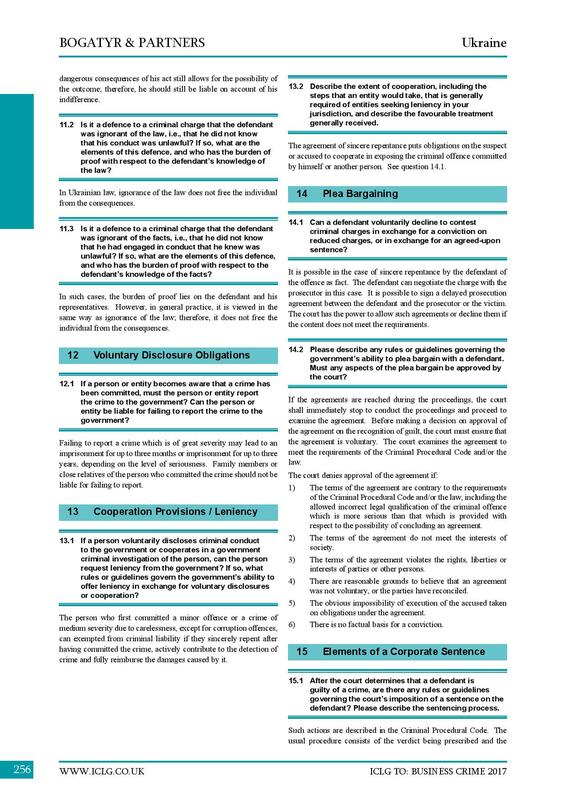 1) The terms of the agreement are contrary to the requirements of the Criminal Procedural Code and/or the law, including the allowed incorrect legal qualification of the criminal offence which is more serious than that which is provided with respect to the possibility of concluding an agreement. 2) The terms of the agreement do not meet the interests of society. 3) The terms of the agreement violate the rights, liberties or interests of parties or other persons. 4) There are reasonable grounds to believe that an agreement was not voluntary, or the parties have reconciled. 5) The obvious impossibility of execution of the accused taken on obligations under the agreement. 6) There is no factual basis for a conviction. Such actions are described in the Criminal Procedural Code. The usual procedure consists of the verdict being prescribed and the deadlines of the appeal being determined. After this, the verdict takes effect. Such verdict can be appealable by the defendant as well as the government in the role of the prosecutor. An appeal against the sentence, ruling or decision of the trial court, unless otherwise provided by the Criminal Procedural Code of Ukraine, may be filed within 15 days from the date of their announcement (and the convict, who is in custody) at the same time (15 days) from the date of handing him the copy of the judgment by the court that decided the verdict, ruling or decision. 7) the victim or his legal representative or representative – in the part concerning the interests of the victim, but within the requirements stated by them at first instance. The court of appeal tends to check the correctness of applying the norms of substantial law and procedural rules by first instance courts. Usually, the courts of appeal pay greater attention towards the uniformity of law application, and it is done by three or more qualified judges. The court may decide to a) uphold the decision of the trial conducted by the first instance, b) change the decision of the first instance and make a new decision, or c) cancel the decision of the first instance and send the case for retrial. At the same time, it should be noted that the investigation of new evidence and full consideration of the case is conducted only by courts of the first instance, and if the court of appeal has uncovered any violations when considering the decision of the first instance in which it is necessary to collect more evidence, then the only way is to conduct the retrial.